Montreal's weekend of baseball once again proved to be an incredible experience that left its mark on the city and the baseball world. The challenge was in many ways bigger this time around, and Montreal once again rose to the occasion, proving that the hugely successful return of baseball last year was not just a novelty, but Montreal reconnecting with a fundamental part of its DNA, as Mayor Denis Coderre rightly says. 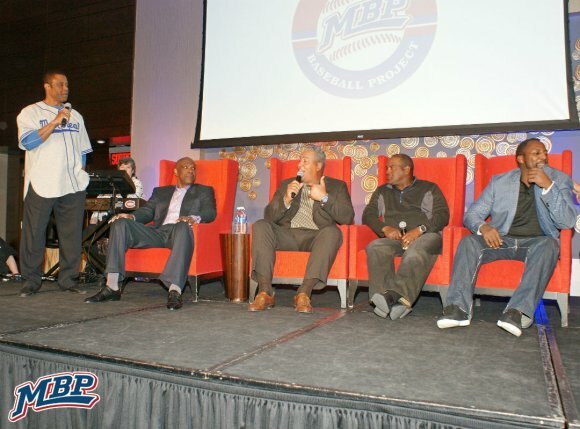 Montreal Baseball Project was excited to be leading off this weekend with our All-Star Gala that reconnected some of the biggest names in Expos history with the city that knew them as 'Nos Amours'. The personal interactions between the honorees and the guests and dignitaries in attendance gave the evening a very special feeling that celebrated the special history that we all shared together. 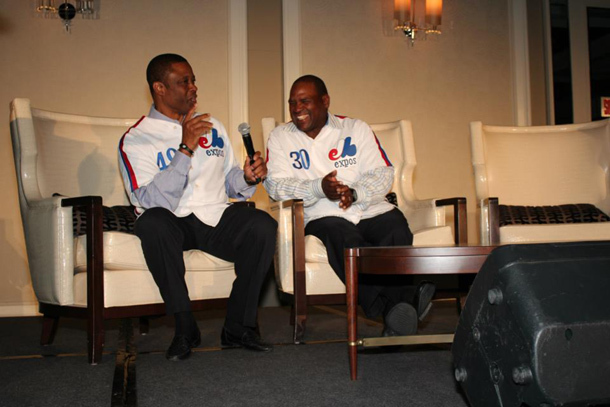 There were some unforgettable moments, like Tim Raines mentioning how Montreal was where he grew up and he felt Canadian because of that, and Andre Dawson describing so eloquently how difficult it was for him to leave Montreal and how committed he is to seeing baseball return here. Andres Galarraga, with his smile as generous as we remembered it, spoke fondly of his time in Montreal as an Expo, as did Vladimir Guerrero, who ended his speech with a 'merci beaucoup', proving how sincere their words were, after spending so many years away from the city. 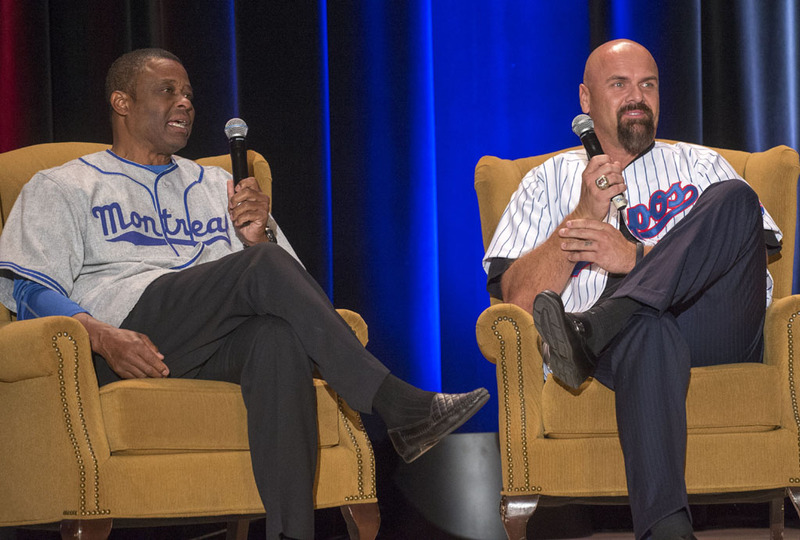 Having them share the stage together along with legendary broadcaster Jacques Doucet was special, given that as many as three of them have a chance at joining Andre Dawson and the late Gary Carter as representatives of the Expos franchise in Cooperstown. There were memories made that will last a lifetime for fans of all ages, and some smaller moments some of our guests witnessed, like when Vladimir Guerrero briefly stepped outside the ballroom to buy an Expos keychain for himself. It made it clear to us how important it was to bring back these remarkable individuals, as much for the fans as for the players themselves. The Gala and the buzz surrounding it in the media would prove to be the big hit to start the rally that was to come in the following days. If last year's exhibition games at Olympic Stadium were about celebrating the 20th anniversary of the 1994 Expos team, this year's games would be about proving baseball had a much deeper meaning to Montrealers and truly understanding what that was. Many were expecting a drop in attendance from last year, including representatives from Major League Baseball. What happened was the exact opposite, as the total attendance not only matched last year's number, but beat it by a slight margin. The heartwarming moments between Russell Martin and his father, and the wonderful ovation the Reds’ Chad Wallach received, simply because so many fans remembered his father's time with the Expos, were taken in by so many children who were themselves watching their first game with their own parents. It marked a new beginning for baseball fans, and a continuation of the revival that began last year. It was as if the difficult years of the Expos franchise were completely forgotten, and we were brought back to the atmosphere of the glory days of the early 80’s. It seems impossible to imagine Major League Baseball not returning to Montreal next year, especially with even more teams expressing an interest in playing these games. Because of this tremendous success, Montreal is no longer just part of the conversation, but part of the circuit. The encouraging comments we have heard from Major League Baseball, including from Commissioner Rob Manfred himself, mark a significant development in what we are trying to accomplish. The questions are steadily shifting away from "if baseball can return" to "when can baseball return". We have clearly moved into a new phase in this big dream of ours, and as much as we are anxious to see progress, it is only by having patience and following due process that we find ourselves closer today than we have ever been. But rest assured, we are continuing to work behind the scenes, making sure we build upon the successes of the past few years and the firm grassroots that have been established. Stay tuned! Click here to see more photos from our Gala! 2014 was a year we will never forget. It began with the astounding success of the exhibition games in Montreal in March and the celebration of the 1994 Expos, and carried through all the way to the end of the year. Montreal remained in the conversation during the All-Star break and World Series, due in part to encouraging comments from Bud Selig, Scott Boras, Paul Beeston and several influential writers. When the Montreal Baseball Project first set out to bring back the 1994 team at the beginning of this year, it was to give them the tribute they so deserved, but never received. There was nothing more fitting than to make them a central part of the festivities surrounding the exhibition games at Olympic Stadium, and to reconnect them with the city that was behind them 20 years ago. But we quickly learned something very humbling at the MBP Gala. There were countless stories we did not know. Like how the outfielders would switch gloves during pitching changes just to make the games more interesting. And how confident the team was heading into any city to face any team and the sense of family they felt not just among themselves, but with others in the organization. John Wetteland went so far as to say that it wasn't closure- it just opened up more questions. It is a big reason why MBP is bringing back some of the most legendary names in Expos history to our Gala in 2015. Rusty Staub and Jacques Doucet were there on opening day in 1969 and together they will reshape our understanding of history and ignite something special once again. Tim Raines and Andre Dawson were the face of the franchise through some of its most promising years, and lived through some unforgettable moments. Andres Galarraga's presence will remind us of how the city has deep roots decades after his big years as an Expo, and how it lives on well after 2004. Their combined presence will create memories that will last a lifetime, and will propel us into the next phase of this big dream of ours. Montreal is now considered the frontrunner to land a Major League Baseball team. This is tremendous progress from where MBP was a year ago. But we can not stop there, because there are other cities watching, looking to build the same type of momentum so they can find themselves where we are. We have to think bigger, and that will be our challenge in 2015. However, one thing is certain: Montreal IS a baseball town and in baseball terms, a five-tool city. That was proven this year, and it will be proven again next April. It now needs to reaffirm itself as a business town, a bustling place where dreams are born and are lived, and where optimism prevails over nostalgia. A big part of the resurgence of baseball here is the boomerang effect of adults who loved the Expos 20 years ago now introducing the game to their own children. Those families are a central part of what we are trying to accomplish, so that next generation can pass this tradition down to their children. The conversation around baseball in Montreal has to shift from simple yes or no questions and answers, to what it would take to bring it back here and make it a lasting success. Those who want to dwell on what went wrong have already missed an amazing ride, one that has transcended and brought ideas and people together like only Baseball can. We learned a lot this year about how strong the passion for baseball is in Montreal, beyond what many had anticipated. 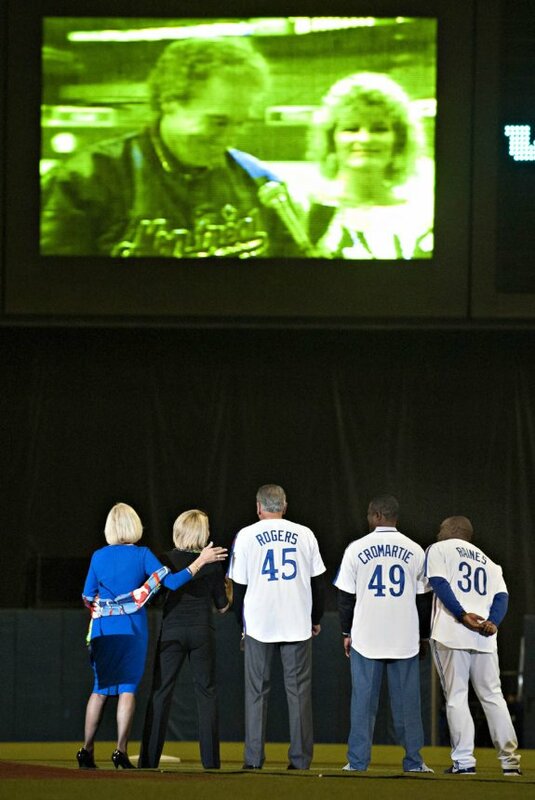 And we were overwhelmed by how much support we have throughout the baseball world. But most importantly, we learned that this is all happening because ultimately there are people who believe in Montreal and what it can accomplish. It is time we all do. On behalf of everyone at the Montreal Baseball Project, I wish you all the best for the holiday season and a safe and prosperous 2015. We can't wait for it! Well, it's been quite an eventful few weeks for us all that began with an exciting end to the baseball season. This year's playoffs gave us quite a thrill ride. From the up and coming teams and rivalries to the beautiful ballparks, there were very few dull moments. The World Series saw my last team, the Kansas City Royals take the San Francisco Giants to a Game 7 that could have gone either way in the bottom of the 9th. In the end, the Giants won, and the word 'dynasty' is now becoming synonymous with their franchise. These are the same Giants who almost left San Francisco for Toronto in 1976, and almost left again only a few years after reaching the World Series in 1989. Today, they are seen as the model franchise, anchored by a ballpark that has revolutionized how the game is seen and has become an unmistakable part of the city's architecture. We also learned that baseball will once again return to Montreal for a weekend in April 2015, after this year's unforgettable series in late March. It should be yet another incredible experience that will mark the path on this journey of ours, and reignite passions once again. 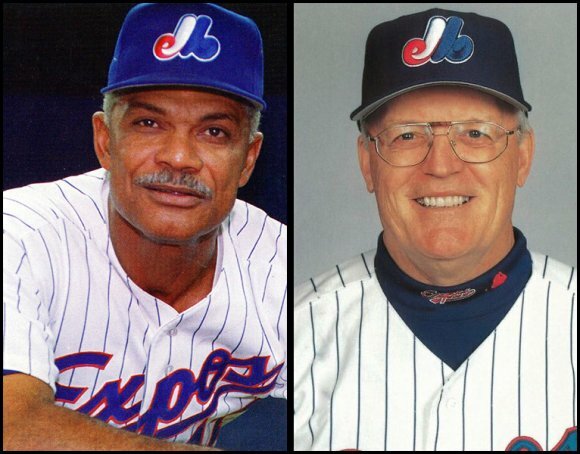 Montreal Baseball Project is proud to be hitting leadoff for this weekend of baseball with our Gala that will reconnect Montreal with some of its greatest baseball heroes, like Rusty Staub, Andre Dawson, Tim Raines and Andres Galarraga, and the legendary Jacques Doucet. Our Gala this spring was an inspiring success, as we learned how critical it was to give the floor to the players, so they can relive iconic moments and we can understand the past from their perspective. And we want you to be there next year to help write another chapter in Montreal's rich baseball history. And yes, there were all kinds of rumors swirling about who may or may not be involved in bringing a team back here and in what capacity. I have always said that it will take patience and following protocol to bring baseball back to Montreal. Rather than speculating, we have to focus on what we can do, and what is within our reach until we are at the next phase. 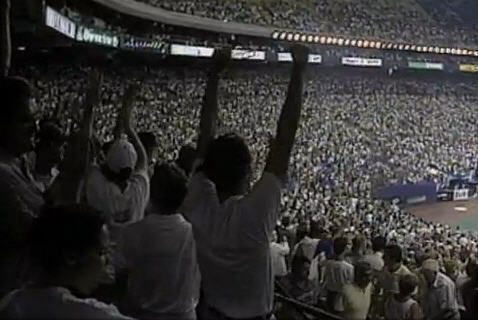 The attendance for this year’s games at the Big O surpassed everyone’s expectations, so much that several teams expressed an interest in coming to Montreal for next year’s preseason games. Blue Jays' president Paul Beeston described those games as having "playoff atmosphere" and said “Your best ambassadors when you left were not just those numbers, but also the 60 players, coaches and managers that said what a great time it was here, too.” As hard as it is to improve on a capacity crowd, we have nowhere to go but up in 2015. We have no choice. It requires us to keep baseball in the conversation. To keep challenging our assumptions, because we will all have to do more to bring baseball back to Montreal. As Felipe Alou revealed to us at our last Gala, it took an extra effort from many people working in different capacities to keep the Giants in San Francisco and build that ballpark. We each have an important role to play to rekindle the same spirit that led to Major League Baseball coming to Montreal almost 50 years ago. To get Montreal to think big again. And from everything I've seen and heard in the last two weeks, I know you're up to the task. September 29 is usually a special day for me. The steady stream of phone calls, e-mails and visits I receive from friends and family have always been an enjoyable part of my birthday. But September 29, 2004 was very different. It was the last game the Expos would play in Montreal. I briefly thought about coming to Montreal for the game, but I could not stand to be there. I felt sick just thinking about it. The final score or who did what on the field didn't matter. There was nothing that could make that game better, and what I've heard from many of you who were there confirm that. I thought of the story that marked the beginning of baseball in Montreal for many of us. When Jackie Robinson was sent to Montreal to play for the Royals in 1946, it was part of a plan to chip away at the colour barrier in baseball. If he was going to continue to be kicked off flights and openly discriminated against, it would be away from the spotlight of Major League Baseball. But in a different country where people spoke another language and looked nothing like him, the opposite happened. 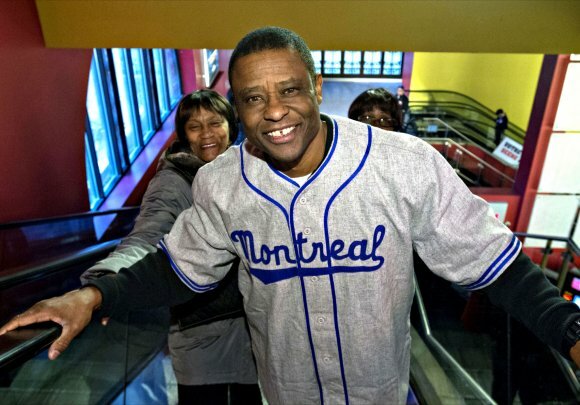 Montrealers opened their doors to Jackie, helped his pregnant wife with her groceries, and when the Royals won the International League championship, they chased him through the streets out of love, not hate. They chose to be positive and uplifting, when it was so easy to give in to the negativity. It goes to the heart of everything the Montreal Baseball Project is doing: changing the tone of negativity surrounding baseball by giving fans and players the chance to reshape how we see the past. 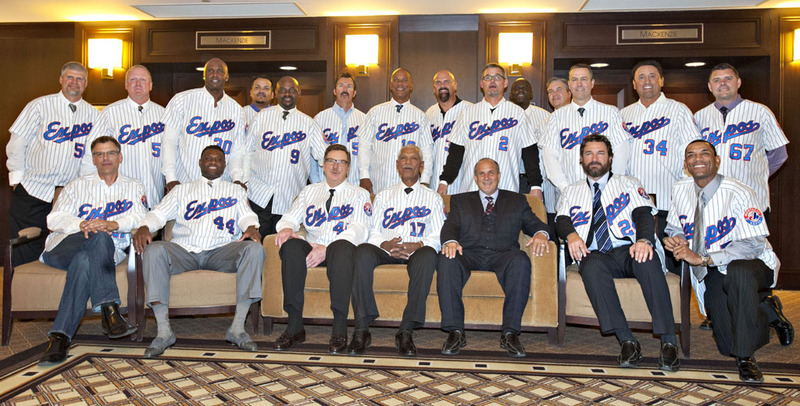 We knew the 1994 Expos team was good, but we didn't know how good until this year's Gala. Larry Walker's story of how the outfielders used to switch gloves and hold staring contests during games was both shocking and amusing to those who was there to hear it first. 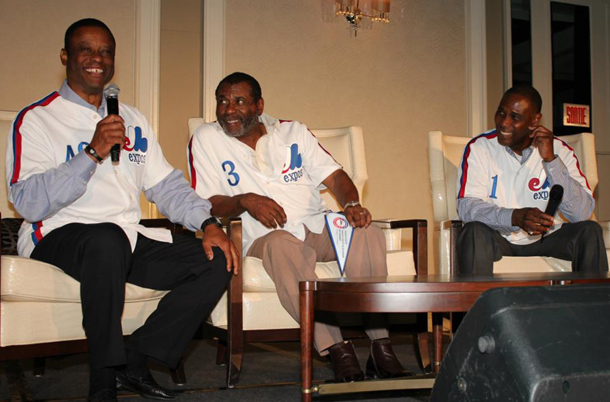 Larry Walker (right) shares stories with Warren Cromartie and fans at MBP's gala in honour of the 1994 Montreal Expos, March 29, 2014. 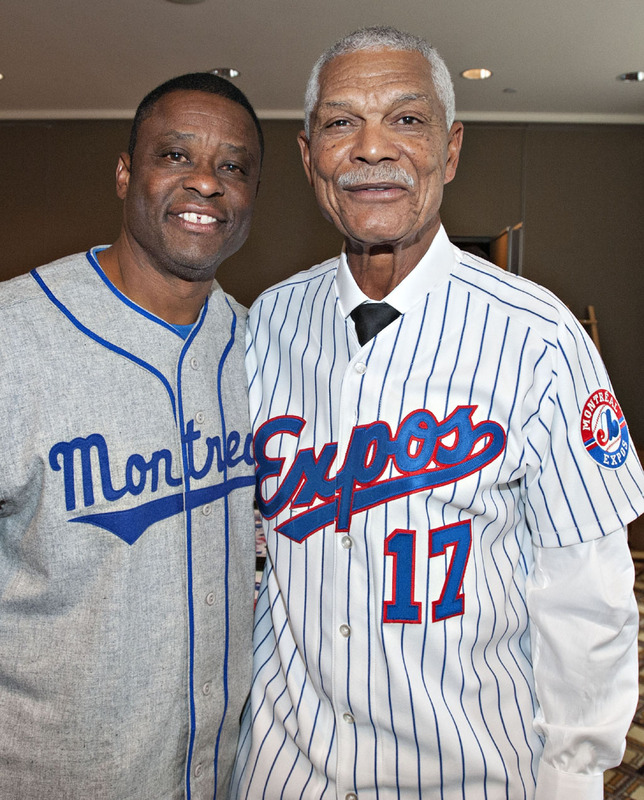 It is why we decided to honour Expos legends Andre Dawson, Rusty Staub, Tim Raines, and Andres Galarraga, as well as long-time broadcaster Jacques Doucet at our Expos All-Star Gala on April 1, 2015. There are some interesting coincidences with these four. Both Staub and Dawson had memorable careers while wearing number 10 with the Expos. Tim Raines was the last Expos player to have his jersey retired, the number 30, while the Gala will mark the 30th anniversary since Andres Galarraga began his career in Montreal. Having these icons share experiences together and shed new light on moments we all remember will mark another shift in how we understand the story of the Expos that is a part of all of us. 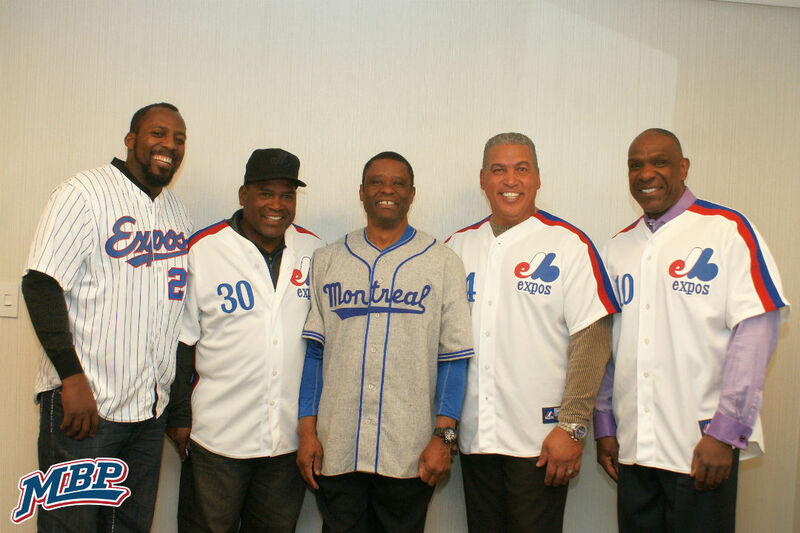 On April 1, 2015, Montreal Baseball Project will honour Andre Dawson, Rusty Staub, Tim Raines, Andres Galarraga, and Jacques Doucet at our Expos All-Star Gala. For more information, please visit our EVENTS page. Monday September 29, 2014 is another opportunity for us to redefine history and counter the negativity behind every doubt about what we are doing. Let’s all wear our Expos colours with pride that day. Wherever you are, whatever you’re doing, share it with the hashtag #MONTRÉALBASEBALL. Whether you’re getting a friendly game going on your local baseball diamond or simply taking a stroll in your neighbourhood, let’s create a wave of Expos gear for all to see. Let it be known that baseball is as alive as ever in the city, and if there is someone who should question their understanding of the past or what Montreal is capable of, it isn’t us. It has a been a busy few weeks for MBP, which included several key meetings to plan for the months ahead. We are pleased to announce that we are in the process of putting together a detailed plan for Major League Baseball, according to their established standards. This includes details about financing, operations and the rendering of a facility. We hope to make another statement about our progress in March, as the beginning of the baseball season is the ideal time for us to be sure we are in the spotlight and remain there. We must continue to be patient and do what we can behind the scenes to ensure Montreal is at the forefront when a decision about a franchise relocation or expansion is to be made. As the baseball season winds down, many are looking back at the year and charting a course for the future. 2014 has been an incredible year for baseball in Montreal, marked by the electrifying atmosphere at the Big O this spring for two pre-season baseball games, and the celebration of our 1994 Expos. For us, 2015 looks to be a year where we build on the successes of the past, and it begins with our Gala. Each of MBP's Galas in the past has given players the opportunity to relive their favourite memories as they saw them, and for fans to take it all in firsthand. They have given us pivotal moments in redefining how we see baseball in Montreal and have lit up the path in front of us today. 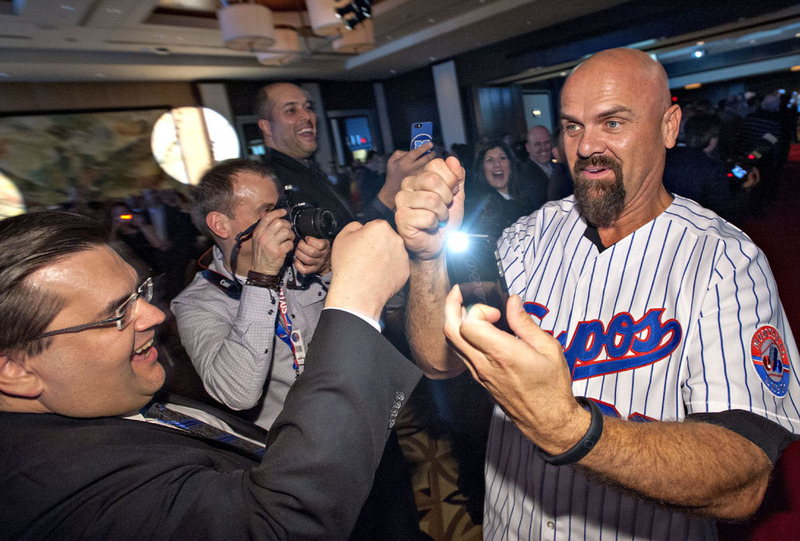 Montreal Baseball Project's 2015 Gala promises to continue that tradition. It will take place on Wednesday, April 1, 7 p.m., at the Hyatt Regency in downtown Montreal. We will honour five beloved members of the Expos family: Andres Galarraga, Tim Raines, Andre Dawson, Rusty Staub and Jacques Doucet. Each represents an integral part of the Expos’ legacy, with deep ties that extend off the diamond and to the city itself. 2015 will mark the 30th anniversary of Andres Galarraga’s debut as an Expo, and the start of a memorable career in which he consistently ranked among the best first basemen in baseball. He is also a man with strong links to Montreal, being the father of two daughters who were born here. 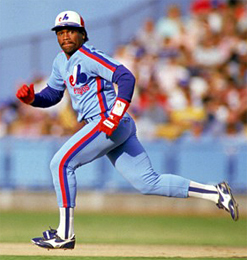 Tim Raines is regarded as one of the best leadoff hitters and baserunners in baseball history. This alone makes a strong case for him to be inducted into the Baseball Hall of Fame. He was the last Expos player to have his number retired, and was there for many key moments, including as a member of the coaching staff for the team's last game. 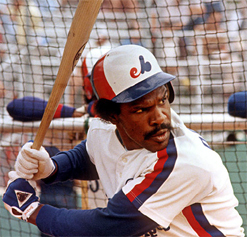 Andre Dawson was the author of an illustrious career and one of the first homegrown stars of the Expos organization. His unrivalled work ethic inspired many of his teammates and helped him overcome one challenge after another, to eventually place him among the legends in Cooperstown. 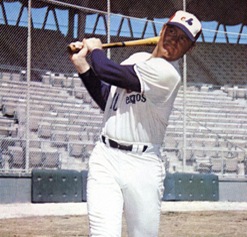 Rusty Staub is synonymous with the early days of the Expos. He was a six-time All-Star and the city's first MLB superstar, a man who became a hero to legions of fans not only in Montreal, but all across Quebec and Canada. 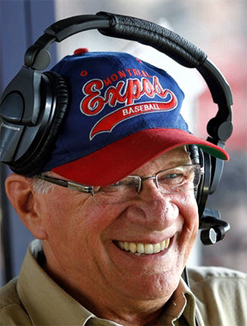 As a journalist and broadcaster, Jacques Doucet lived through every moment in the history of the Expos and was instrumental in bringing the game to life for millions of French-speaking baseball fans over the years. His longevity and unique contribution to the game have consistently put him on the verge of entering the Baseball Hall of Fame as a broadcaster. We can't wait to see these legends together, as we take yet another bold step towards our ultimate dream of making Montreal a Major League city again. Tickets go on sale Friday, September 12 on our events page. 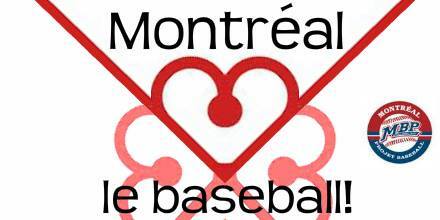 For more information, please write to info@montrealbaseballproject.com.We hope to see you there! 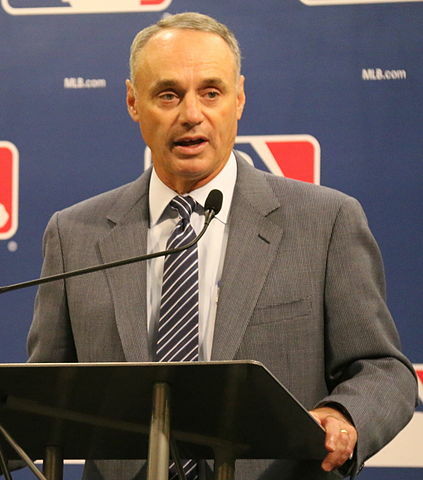 Last week, Major League Baseball chose Rob Manfred to succeed Bud Selig in January as its next Commissioner. I have been asked what my feelings are about this selection and what we are trying to accomplish at Montreal Baseball Project. To begin, the new Commissioner is gap-toothed and has a great personality, which is a great start between him and me. With all of his experience with Major League Baseball and over two decades of labor peace, allowing the game to be successful for so many years, Rob Manfred has a lot going for him. Help bring Major League Baseball back to Montreal! 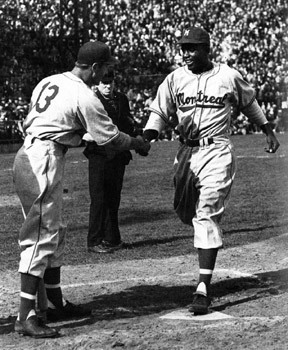 The return of baseball to Montreal would be a big part of his legacy, and would immediately reaffirm the international reach of the game and reconnect it with a missing part of its history. I am certain Rob Manfred has had conversations with Bud Selig about Montreal, and is well aware of what we are trying to do. I think he will be fine, and so will we. We have to continue to do what we have been doing and keep our ears open for his first public comments about Montreal as a future location for a franchise. 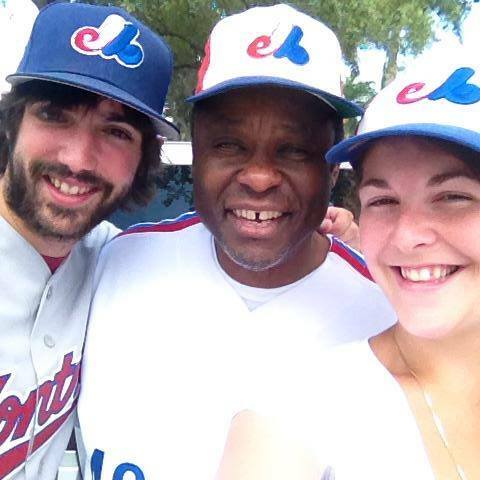 In late July, I had the great pleasure of meeting Gabriel Morissette and Adry Laurin, two Montrealers visiting every MLB stadium this summer to promote the idea of bringing baseball back to this city. I must say I am tremendously proud of these two for going on this 3-month journey in support of this dream we all share. Their initiative demonstrates the groundswell of support there is at the grassroots, particularly among the youth, for the return of MLB to Montreal. Every visit of theirs has become an opportunity to strike up a conversation with baseball fans all across America about how deeply the game resonates in Montreal. Their journey is raising a lot of awareness and publicity for what we are trying to do, even though their car is not in the best shape. By the end of this trip, it may find itself in an institution. But as long as they keep changing the oil and the filter, they should be all right. It is great to have that kind of support and dedication, and I encourage you to follow them on Twitter (@mtlontheroad) and check out their blog on their website. You will definitely want to look out for my next blog, when I will have a couple of announcements pertaining to baseball in Montreal. Stay tuned! For many of us, watching the All-Star Game this week was an opportunity to reflect. It remains a high-profile event that promotes baseball and lets the fans participate in a big way. Over the years, the Home Run Derby has taken center stage, and the game itself has lost some of its lustre. I personally think the World Baseball Classic should be part of the festivities. But of all the sports, baseball's All-Star Game is still the only one with real consequences, and that has most closely resembles the game fans are used to seeing. This year, the highlight for Montreal baseball fans came off the field. During Commissioner Bud Selig's meeting with the press, he declared that Montreal was "an excellent candidate in the future" for a team, and that the two exhibition games in March were "very impressive" and "marvelous." These comments made headlines throughout the baseball world and beyond. They were a testament to how much we have accomplished together in such a short while. Those two games in March and everything leading up to them are part of a revolutionary change in how Montreal is being perceived. I remember what it was like in 1982 when we had the All-Star Game in Montreal. The city was on fire during that time. It was a destination, THE place to be. Aside from the players, there were movie stars, celebrities, and TV crews from all across North America arriving in Montreal. They came for the baseball experience, but they would take in so much more. I remember how places like Ben's Deli were as popular as ever, and how the event overlapped with everything iconic about Montreal. Recently, Montreal mayor Denis Coderre said that bringing baseball back will be what will truly make Montreal a sports town again. As much as the Grand Prix and the Canadiens play a big role in promoting the city, the return of Major League Baseball would have its own far reaching impact. It would bring Montreal into the conversation on a continuous basis. It would our city a destination again, and allow us reclaim our place on the big stage. But getting back to the All-Star Game in Minnesota, it is amazing to see how the event opens a city to an international audience. It is another side of baseball that makes it so special. Each ballpark is a landmark that allows a city to showcase itself to the world. It brings together the region's architecture, its history and its culture into an experience that is both familiar and unique, and that people travel from all over to take in. It is that type of involvement that Montreal Baseball Project envisions in this big dream of ours. Montreal deserves that same opportunity to build a monument to everything great about itself, and that so many people can be part of together. It's been a while since the phenomenal success of the spring, when Montreal got its first taste of baseball in a decade. It was tremendous to have nearly 100,000 fans pack the Big O for Major League Baseball for the entire world to see. 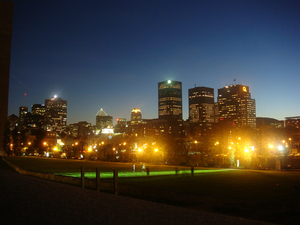 It lit up the city, and baseball became THE topic of conversation in Montreal. I saw how old fires were rekindled, and how new grassroots were established at the game. Children who had never had the opportunity to watch a baseball game were now taking one in. Just like for many of us, it was the start of something special, a lifelong passion that lives on many years later. It is disappointing to still hear doubts about what we accomplished, particularly from people who were part of the Expos organization for so many years. Some of them believe this idea of bringing baseball back is a long shot at best. I think they are out of touch, unaware of how much has changed. They are not in the city anymore, and are still stuck in another time, when things weren't quite right. Overall, I am tremendously pleased with what has been accomplished in the last little while. If it were easy, it would have been done already, but we've put a lot of hard work into the project so far. The progress we have made has turned doubters into believers and I look forward to continuing this journey to make Montreal a big league city again. Where we are now is right in the middle. We are in a holding pattern, doing what is required and what we can do behind the scenes, until the right opportunity to bring a team here presents itself. One thing we are not planning to do is build a stadium without a team. We have to continue to approach this with patience, because this is what has put us in the driver's seat ahead of other cities that have shown an interest in Major League Baseball. We will continue to celebrate Montreal's rich history of baseball, through galas and other events, to light a fire for the future from our successes of the past. We have a strong group that is doing some great work behind the scenes. We are gaining the trust of the public, and are proud to be ambassadors of baseball in Montreal. We are going full steam ahead from here, engaging various people and groups to ensure we keep moving in the right direction. On July 12, Expos Nation will be making its presence felt at Citi Field in New York at the Mets-Marlins game, as part of its Expos Day initiative. It is an ambitious idea that deserves our support. It also reflects the type of effort we should be looking to make, given what we have accomplished and where we stand today. WOW. WOW, WOW, WOW. What a fantastic weekend. Where do I begin? There is so much to say and share about our incredible weekend of baseball. It was Montreal's first taste of the game in a decade, and by all accounts, Montreal baseball fans didn't miss a beat. I'm surprised, but not that surprised by how the fans showed up. When we had the press conference in September to announce the games, I made the call out to Montrealers about how critical it was to be there, how the whole world will be watching. This would be an indication of how much we wanted baseball, and the turnout was twice what many people expected to be. On a personal note, I wondered what the fans would be thinking when they entered the stadium. It would be different this time. They were coming to see baseball, not the Expos. But it was easy for them. It seemed like nothing had changed in the last 10 years. It was amazing to see families united again to watch a baseball game and watch new grassroots take hold, with so many young fans in the crowd who had never seen a baseball game in Montreal until last weekend. I realized once again how baseball has this tremendous ability to transcend, to bring people together in the worst of times and in the best of times. It has a knack for calming unrest and cutting through language barriers. Baseball has a way of bringing communities, cities and nations together. What happened last weekend was monumental for the city of Montreal. I understand there is a lot happening on the political scene. But for those two baseball games, no one was thinking about that. Everyone was thinking about having a good time and being in the presence of a game the city loves. That's what baseball does. It transcends. A sold-out MBP Gala took the weekend to another unforgettable level. Tributes to Claude Raymond and Felipe Alou brought tears to many people’s eyes, including my own. The Gala brought a sense of closure to the lost 1994 season that many of us needed. We heard memorable stories of how the players made it all happen. Larry Walker shared some hilarious stories, like how the outfielders would sometimes switch gloves during pitching changes just to make the games more interesting. John Wetteland, a World Series MVP with a franchise as prestigious as the New York Yankees, talked about how old school he used to play and his story about his feud with Chucky Carr was priceless. The personal interactions with the players before and after the Gala led to some fascinating discussions. It was heart-warming to hear Walker return to praise the city that he left under circumstances that were perhaps not the best. Wil Cordero laughed about the times he took the Metro home in his Expos uniform, just because he could do that here. After taking all of that in, I realized last weekend wasn’t just about Montreal reacquainting itself with baseball, but baseball rediscovering its roots in Montreal again. It brought me back to how it started, with a tribute to Gary Carter, and how his wife Sandy and daughter Kimmy waved to the crowd emotionally, just like they waved back to them. For so many who spent time here, Montreal has a special place in their hearts. Hearing the feedback from everyone after the weekend reminded me of how much the game means to Montreal and how much the city misses it. This was a weekend to remember. We hope to continue working with evenko to make this an annual event until we get our team back. There were representatives from Major League Baseball at the game, and their words spoke volumes about how the world took notice. “I’m going to tell commissioner Bud Selig that things were better than even I expected and that I was very, very, favourably impressed. There is a fire that burns brightly here for Major League Baseball and that’s a message that I’ll be proud to carry to the commissioner,” said MLB executive John McHale Jr. There is now no doubt Montreal is a baseball city, and I look forward to continuing this journey. We have crossed some major hurdles but we still have a ways to go. We made the right impression and a lot of noise along with it. Montreal sure knocked it out of the park. There are two things in baseball that never change: history and numbers. As far as Major League Baseball in Montreal goes, the numbers are in and numbers don’t lie: we are viable! Today Montreal Baseball Project, in collaboration with the Board of Trade of Metropolitan Montreal, Ernst & Young, and BCF LLP, announced the results of a feasibility study on the viability of Major League Baseball in Montreal that we launched back in March. Although I’ve known all along Montreal is still a baseball city, we felt it was important to put that question to the population and to the business community in order to back up what I already personally believed. I could not be more pleased with the results. We are closer to our goal now than at any time in the last decade. According to a Leger Marketing poll conducted as part of the study, the return of Major League Baseball to Montreal would be embraced by both fans and the business community. Nearly 70% of Quebecers are in favour of bringing the game back to Montreal. Among corporations, 81% support the return of Major League Baseball. How does this kind of support translate into fannies in the seats? Leger Marketing found out that fans would be willing to pay $50 to see a ball game. Leger also forecasts an average attendance of 28,500 per game. Multiplied by 81 games a year, we are looking at a little over 2.3 million in attendance over the course of an entire season. Those are some great numbers in my opinion! A lot of hard work has gone into bringing us this far but our work is not done. We’ve arrived at a very important stage in the journey to bring Major League Baseball back to Montreal. My next task is to find a champion. I’d liken what we have done to mounting a late-inning comeback. We’ve scraped, battled, and chipped away at adversity. 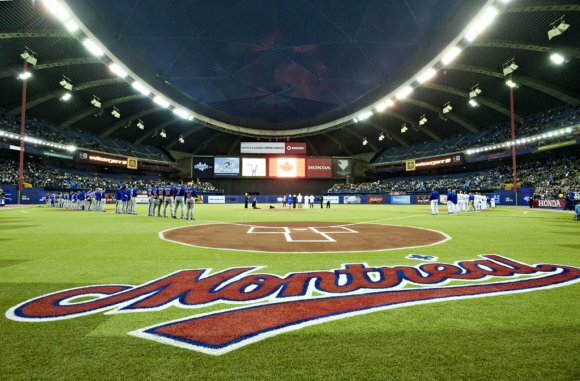 Montreal Baseball Project, the Board of Trade, the Montreal business community, and, of course, Montreal baseball fans, who’ve shown their support and passion right from the beginning, have loaded the bases. So now, we are looking for a champion to emerge from the dugout. We need a power hitter to step up to the plate and bring everybody home. A big player who has the assets, the passion, and the integrity to make history. A champion who has the same dream I have. The same dream that millions of Montreal baseball fans have never given up on: the dream to bring Major League Baseball back to Montreal. And to bring the Montreal Expos back to life. Somebody’s going to hit the home run that will be remembered forever. If you want to play the role of the champion in this story, I’m waiting for your call. Today I announced at a press conference Montreal Baseball Project’s 20-year Anniversary Gala Celebrations for the 1994 Montreal Expos, “The Best Team in Baseball.” On Saturday, March 29, 2014, 7:00 PM at the Queen Elizabeth Hotel, we’ll toast one of the best – if not the best - all-around teams the Expos ever fielded. Tickets go on sale Tuesday, October 1 at montrealbaseballproject.com. The ’94 Expos were running away with the National League East, well on their way to the post-season and a chance to take home the World Series. Names like Pedro Martinez, Larry Walker, Moises Alou, Marquis Grissom, Ken Hill, John Wetteland, and Jeff Fassaro come to mind, just to name a few. We had a local kid by the name of Denis Boucher taking the mound for the Expos in ’94, too. And with Felipe Alou steering the way, this was truly a team for the ages. We all know that circumstances at the time brought the 1994 season to an early end. Unthinkably, the playoffs and World Series were cancelled. Despite this, I know that the 1994 Expos are still champions in the hearts of all Expos fans. MBP’s Gala Dinner will be a great opportunity for fans to say thanks. I am also very happy to say that MBP will be honouring both Felipe Alou and Montreal’s own Claude Raymond during the course of the evening. In addition to our two guests of honour, we have at this point a number of players from the ’94 team who have confirmed their presence: Moises Alou, Marquis Grissom, Rondell White, Tim Spehr, Lenny Webster, Sean Berry, Cliff Floyd, John Wetteland, Jeff Fassero and Denis Boucher. I am waiting to hear back from Larry Walker and Pedro Martinez and I’ll be updating more names as they come in. In addition to the Gala, an exclusive VIP Cocktail with the ’94 Expos will be available one hour prior to the Dinner. All the details about the different ticket packages can be found here. You’ve probably noticed that our Gala falls on the same weekend as the recently announced exhibition games between the Toronto Blue Jays and New York Mets at Olympic Stadium. With a night game on Friday, an afternoon game Saturday, and the 1994 Expos Gala on Saturday night, it’s going to be a great weekend of Major League Baseball in Montreal! It only goes to show how valuable Montreal will be in the long run for baseball. 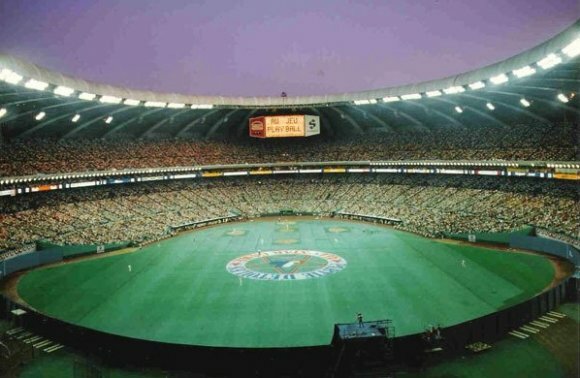 And to make it an even more special weekend, I am pleased to announce that Montreal Baseball Project, in collaboration with evenko, will welcome the 1994 Expos onto the field at the Big O prior to Saturday afternoon’s game. I predict a mass outbreak of laryngitis from all the cheering that’s gonna go on. I don’t think I can emphasize enough how critical it is for Montreal baseball fans to show up to these games. Attendance will be used as a measuring stick. 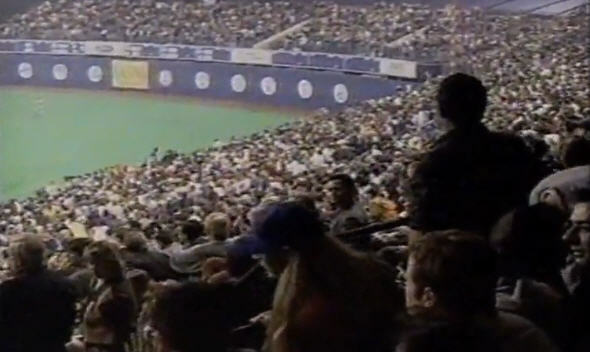 This is your chance to show how much Montreal wants Major League Baseball back. The entire baseball world will be watching with magnifying glasses. We wanna show them fannies in the seats! I encourage all Expos fans, all of ExposNation, and all fans of Montreal Baseball Project to come out strong, make some noise, and enjoy some baseball. I understand that the Blue Jays, along with 27 other teams, voted to contract the Expos in 2001. But don’t let this stop you from going to these games. Montreal can forgive, but we don’t have to forget. Just keep the big picture in mind. I remember when Toronto came into Major League Baseball. They didn’t have much of a stadium to play in at first, but we looked forward to going over there to play for the Pearson Cup. We looked forward to helping the other guys along while striking up a sort of rivalry, even though they played in the American League. So now, with the Blue Jays coming here in March, giving Montreal a chance to fill the Stadium for two ball games, it’s déjà vu in reverse. Let me just say how great it is to hear so much baseball talk in Montreal lately, and it’s only increasing all the time. We are making progress, we’re still taking things one step at a time with the feasibility study, and I look forward to the day the Expos – Canada’s first Major League Baseball team – can return. In 2004, Montreal couldn’t save the Expos. Mistakes, a lack of vision, and a long – too long – list of disappointments added up to a situation that was beyond rescue. Fast-forward ahead nine years to today and the city is in a rather unpleasant situation of its own. Scandals, corruption, and dirt dominate the headlines and paint an ugly picture. But not all hope is lost. 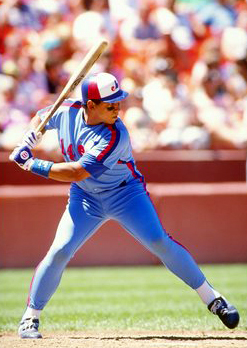 The Expos can save Montreal. I have witnessed the healing power of baseball many times over. It’s a game that cuts through divisions – there’s only one language in baseball and it’s called Baseball. It’s a game that lifts us up from tragedies, helps us to forget our fears. Baseball is all about second chances. If you strike out in your first at-bat, you get a chance to redeem yourself your next time up. Baseball is all about hope. If your team falls short of winning the pennant one year, the promise of “next year” kicks in. I am happy to report that the spirit of baseball has not completely faded from Montreal – far from it! I saw the game work its magic firsthand on June 15, at the inauguration of Gary Carter Field at Parc Ahuntsic. Regarding where we stand, I am very pleased with the way things have been going and I am very pleased with the way the general population and the business community have responded to our initiative. While work on our study is still ongoing, initial results are very encouraging. Montreal wants baseball back. We expect to have all results in hand by the end of this year. This journey keeps getting better. Jackie Robinson’s words ring so true to me, especially after the whirlwind the last few weeks have been. Back on March 20th, Montreal Baseball Project announced the launch of a major feasibility study to examine the possibility of bringing a Major League Baseball franchise back to Montreal. 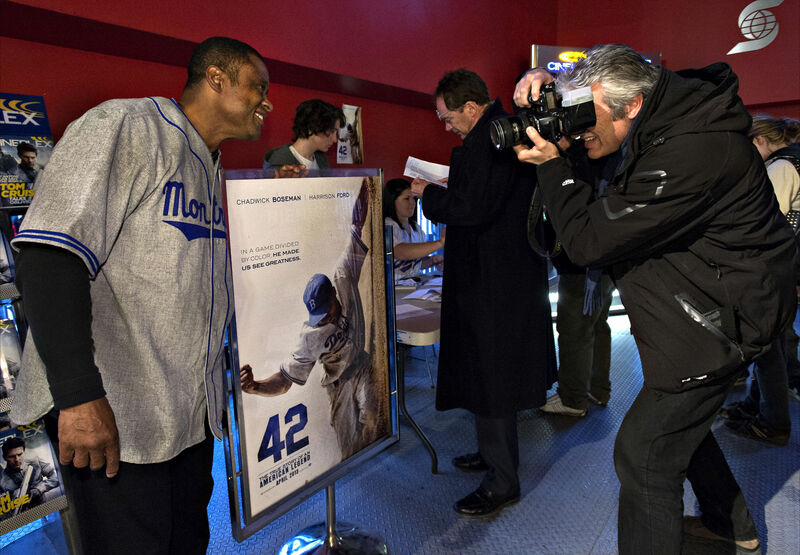 Two weeks later, we presented the advance-premiere of 42, the major motion picture Jackie Robinson story, to a packed house at the Scotiabank Cinema in Montreal. Needless to say, there’s been no grandstand sitting on this journey. I wouldn’t have it any other way. I was so pleased to sit beside representatives of Board of Trade of Metropolitan Montreal, Ernst & Young, and BCF to announce this good news. The feasibility study is going to be meticulous, taking every necessary step, one step at a time. It’s in very good hands. And the reaction to the announcement has been tremendous, especially in Montreal but also all across Canada and down in the States. Opening Day is always a time of hope and this year, for the first time in a long time, Montreal had some hope of its own. On April 3rd, MBP presented an advance screening of 42 in downtown Montreal. We were the only city in all of Canada to have the movie so early – not bad for a city without a team! We showed the film to a capacity crowd of Montreal baseball fans, and let me say that the city’s passion for the game was once again on display. There was a sea of baseball caps (mostly Expos, of course), jerseys, and smiling faces. The movie itself was amazing. It might even be the best baseball movie ever made. Every athlete of color that’s come along in the last 66 years has Jackie Robinson to thank. 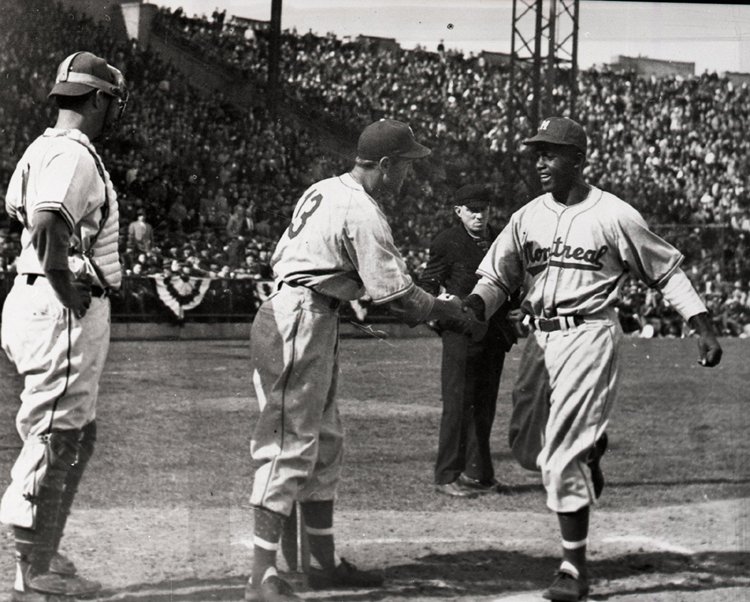 And, as the film pointed out so well, we all – black, white, green, striped, whatever – owe Jackie Robinson a big debt of gratitude. By showing us that race means nothing between the lines of a baseball field, he made us realize the same should be true off the field. We’re still working on it, but we’ve come a long way since Robinson went through hell for the sake of all the rest of us. Claude Raymond was on hand to provide some first-hand historical perspective. He stood up and told us about his days in the minors playing with Ed Charles, who was portrayed in the film. Claude recalled how when the team bus would stop at restaurants in certain cities, he’d bring a sandwich to Ed, who would wait in the bus because he wasn’t allowed inside with the white players. When I was up there hosting the movie event, I felt Jackie Robinson’s presence in the room. I thought about how it was nearly one year to the day that I began this journey. And as I looked into the eyes of the crowd who were hungry for more baseball, the feeling that I had was unmistakeable: something’s happening. I thought about how baseball transcends sports. It has this ability to combat uneasiness, to make sense out of tragedy. Baseball has a great calming effect – think of 9/11 when it was baseball that started the healing process when President Bush threw out the first pitch at Yankee Stadium in New York. I thought about how baseball is played by nine different personalities on a team. They may not like one another but you become a team and cut through the hatred. After the game, some guys might stick around and hang together, others might take off in different directions, but come the next game, when it counts, they are a team. Baseball can do the same for the city of Montreal. Baseball has a way of uniting people. Imagine what a new ballpark and the return of Major League Baseball could do for Montreal. A common accomplishment to celebrate together. My team, the Expos, were named after Expo ‘67, one of this city’s greatest accomplishments, one of this city’s proudest moments. Expo was a time of wonder, happiness, and great optimism for the future. The feeling was that a new and amazing era was on the horizon. Montreal Baseball Project’s journey is about rekindling that special Expo spirit and unleashing it on the city again. I feel in my heart that Jackie Robinson is behind us on this one. Montreal Baseball Project made a bit of a splash when we launched our new website in the beginning of January. The reception has been extremely positive and encouraging. Supporters of baseball in Montreal should know that MBP's work toward our stated goal – to bring Major League Baseball back to Montreal – is continuing in the background. The Montreal business community is stepping up to the plate and we’ll be in discussions throughout the month of February. In the meantime, MBP and the city of Montreal continue to get good press on both sides of the border. 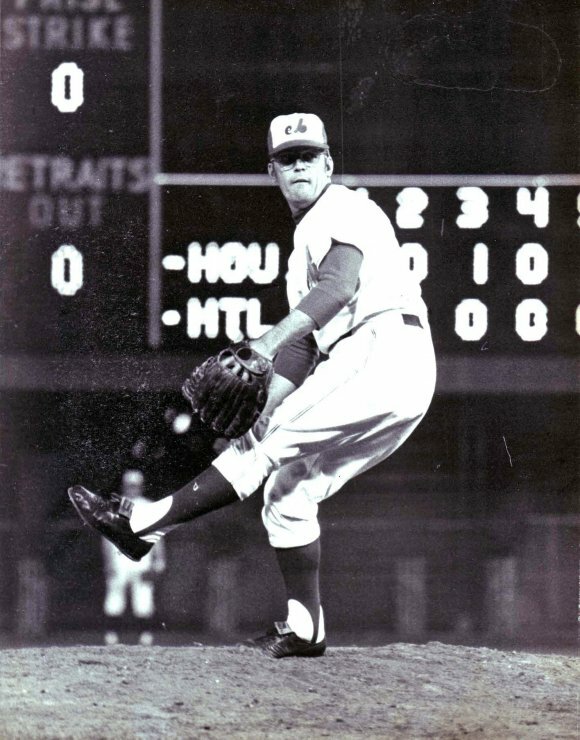 Scott Ferguson recalled last week on TSN.cahow baseball “fans in Montreal were more boisterous and emotional than most (he’d) seen in the Majors.” He recognized that Montreal Baseball Project is “trying hard to get the Majors to return to Montreal.” Don’t I know it! Most significantly, though, Ferguson points to Montreal as a logical target city for Major League Baseball should the need arise. Ferguson joins Jim Caple and Keith Olbermann in expressing the same sentiment about the future of baseball in this city. Hey, it’s like I always say: The history of baseball in Montreal is long, rich, and unfinished. I was so pleased to learn that my Expos teammate Tim Raines has been named for induction into the Canadian Baseball Hall of Fame in St. Marys, Ontario. I believe Rock also belongs in Cooperstown, but this is a great honor for Tim. Good for the Canadian Baseball Hall of Fame for recognizing his qualities. Raines recently joined the Toronto Blue Jays as a baserunning and outfield coach. He’ll be a great addition to that organization. 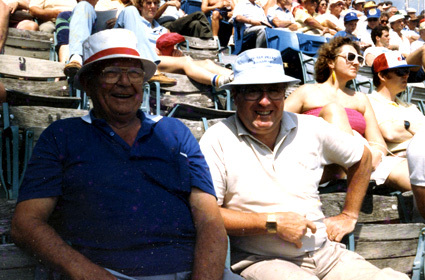 With spring training right around the corner, I find myself thinking of how I always looked forward to spring training with the Expos in in Daytona Beach and, later, West Palm Beach. Even though I’ve been retired since 1991, I still feel that sense of renewal and hope that spring brings every year. Living in Florida, I always enjoyed making the drive from my home in Miami to the Expos’ spring facilities. Spring training for me was about getting into shape and reconnecting with teammates, a lot of whom you wouldn’t get to see from the last day of the previous season until the first day of spring camps. In addition, it was always a really neat thing to witness the influx of fans from Canada, escaping winter for a little while, getting up close to us players, taking pictures, showing their loyalty to the team, and watching some baseball. The excitement on the faces of the fans was what spring training was truly all about. While I was always happy to see the guys on the team again, I wasn’t always happy about having to fight for a job come spring. Luckily for me, I had versatility on my side (I could play first base as well as the outfield) and, just as importantly, I was durable. I did my best to steer clear of the training room, keeping myself healthy and on the field. In fact, from the time I became a starter in 1977 to the end of my tenure with the Expos in 1983, I appeared in 96% of the team’s games. That includes all 162 in 1980, a year in which I was only one of nine Major Leaguers to suit up for every one of his team’s games. Other names on that list in 1980 included Pete Rose, Dave Winfield, Steve Garvey, and Al Oliver, my future teammate who was with Texas at the time. Durability was always one of my proudest achievements as a ball player. 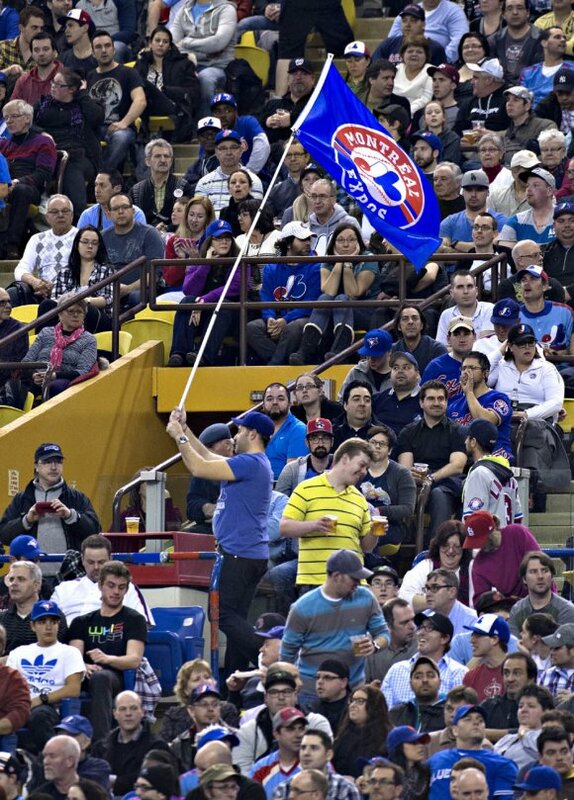 Hopefully, one day soon, Montreal baseball fans will be able to head down to spring training once again to cheer for their team and welcome them back for yet another baseball season. If I had to sum up the summer of 2012's Montreal Baseball Project celebration and reunion in just one sentence, it would be this: Baseball is alive and well in Montreal. Even a few months later, the feelings are still so strong. 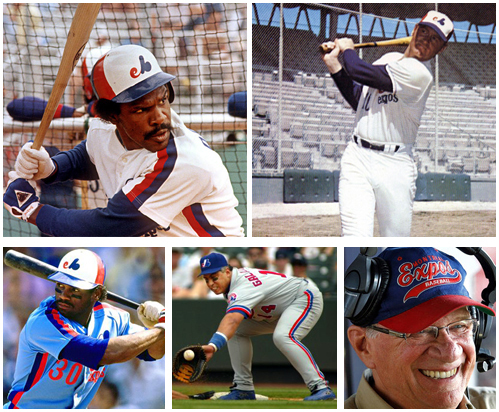 From the autograph-signing sessions, to halftime on the field at Molson Stadium, to the golf tournament, to the baseball clinics with the kids, and to, finally, the gala, the 1981 Expos were once again the toast of the town in Montreal. There were so many great moments. Andre Dawson and Jim Fanning made sure everybody who wanted an autograph got one, signing for four hours! 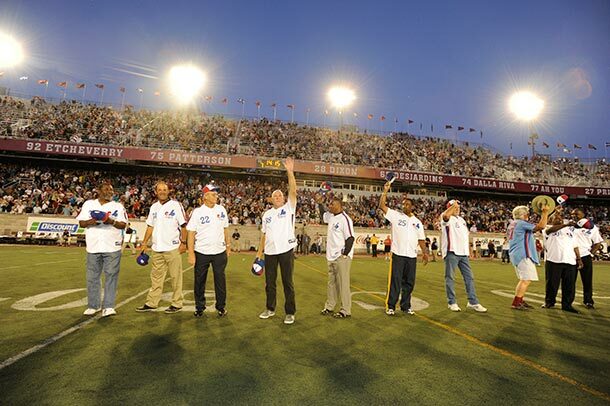 The reception my teammates and I received on the field at the Alouettes’ game was just tremendous. We felt the love once again and a little bit of “Val-de-ri Val-de-ra” was thrown in for good measure. I took the mic and wowed everybody with my eloquence en français (Je t’aime, Montréal!) and we’ve had more than a million hits on the video of that moment already. Who says Montreal doesn’t still love the Expos? At our fanfare and baseball clinics, the fans were able to get closer to the players and, just as importantly, us players were able to get closer to the fans. It was great to see kids too young to ever attend an Expos game, yet who wear the apparel, get to see real live Montreal Expos up close and personal. All of these wonderful events led up to Saturday night’s amazing gala dinner. What a vibe we had in that room. To get a crowd of Expos fans together with the 1981 East Division Champion Expos was something I’d been trying to pull off for a number of years – and a lot of people thought I’d never be able to do it – and we finally did it. The spirit of Gary Carter was there that evening, you could just feel it. And to top it all off, I did my Cro-prah. You’ve heard of Oprah, but Cro-prah is MY talk show. With three seats up on the stage, let’s just say that I got my guests to talk! We had such a tremendous evening and witnessed such a tremendous outpouring of support. We really hit a home run. The gala weekend has come and gone, but my work is far from over. I see it as a great beginning to my journey. Phase II of Montreal Baseball Project begins now. In this stage of the Project, the fans are going to get their opportunity to really get involved (more precise details on this are coming), and I will continue making connections, speaking to politicians and to the people who make a difference in this town. One thing’s for sure: Montreal is really passionate about their sports and they’re hungry as hell for baseball. You are all going to get your chance to demonstrate just how hungry you are come the fall. Be seeing you around town.